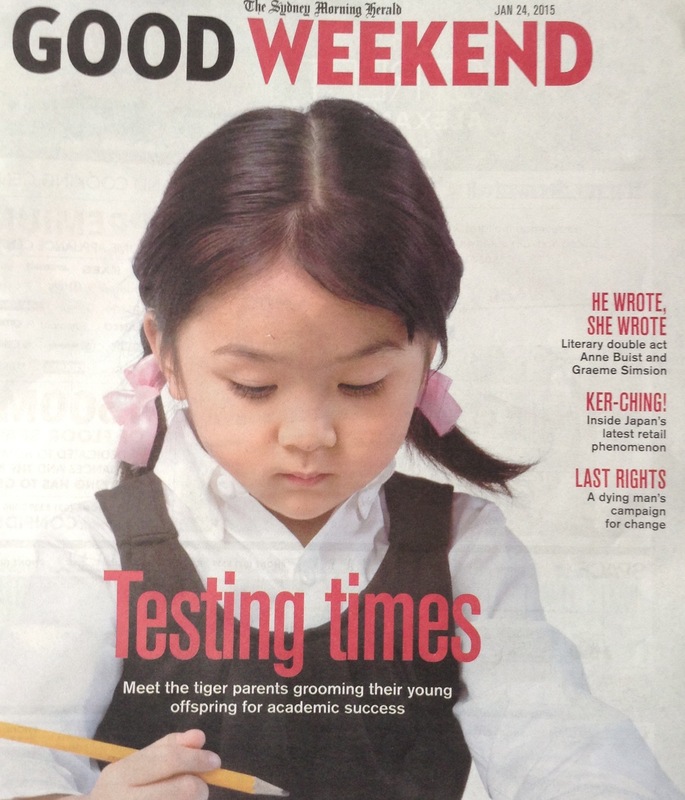 The cover story in the Good Weekend, the Sydney Morning Herald’s magazine: Testing Times: Meet the tiger parents grooming their young offspring for academic success by Anna Broinowski. This article was particularly focused on families of Asian background and the ‘tiger mom’ tendencies. In NSW, my state, there are 21 academically selective schools and 26 partially selective schools. Many parents spend a lot of money and much of their child’s ‘childhood’ in cramming for selective school tests. One coaching college boasted that 1033 students earned places in 35 selective schools, no data on those who failed to gain a place. In two states, NSW and Victoria, there are 3000 tutoring business, with an annual turnover of $200-$400 million and only 8% are registered with the Australian Tutoring Association. We empathise with parents, especially those of us who have had to make these choices, wanting to do the best for our kids. Our own sons, now 31 and 28, both went to government high schools – the elder to the local comprehensive and the younger to a performing arts high school. Our elder son undertook an MBA after his initial degree and is successful in business. The younger, is working hard to pursue his music and songwriting career, while working as a barista. His HSC mark was not sufficient to earn a place at university after Year 12, nor was it his goal. However, last year, he decided to go to uni, study a BA in literature and is getting High Distinctions and Distinctions for much of his work – maturity and purpose mattered. We are proud of our kids. They are kind, considerate and wonderful humans. They really think of themselves as lifelong learners, work hard and enjoy life. As parents, we didn’t push hard, they were pretty well-rounded in their social, sport and cultural activities. Today, we like them as people and enjoy their company, and it seems that they quite like us as well. that there is more to life than the score/mark to study a course at university, one that they may not want to pursue in the first place. that the cramming, coaching and memorisation may get their child to university, but won’t necessarily be enough to keep them there. that raising a contributing human is far more important than being able to tell your social group how well your child did at school. that things change – even school. Your experience of school should not be the same for your own children. that passion matters. Take time to discover what does your child loves to do. that, above everything else, relationships matter. Careers, opportunities will come and go. Our children will face difficult and challenging situations. They will make both wise and unwise choices along the way. But through it all, we want to stay in relationship with them. We can choose to see life as a broad spectrum of opportunities that match the breadth of passions and interests of humanity, or, as a pie. If I take a piece you won’t have it, or if you take it, I miss out. Many parents send their children to schools that have life-long learning or independent learning as part of their mission. These schools need to explain to parents that tutors and coaching colleges do the exact opposite – they create dependent learners so that they will keep coming back. I think Stephen Porges’ reflection on the purpose of education is worth considering here “Are the goals of our institutions to educate people with more information or are our goals to make people be able to reciprocally interact and to regulate each other to feel good”.